The crime scene in Linden, NJ where suspected bomber Ahmad Khan Rahami of Elizabeth was captured after a shootout with police. Jewish schools and synagogues in New Jersey are on high alert after it was learned that there were several connections between the Garden State and the Sept. 17 bombings in Manhattan’s Chelsea neighborhood in which 29 people were injured. For Jewish organizations, the incident served as a chilling reminder of the need to institute advanced security measures. 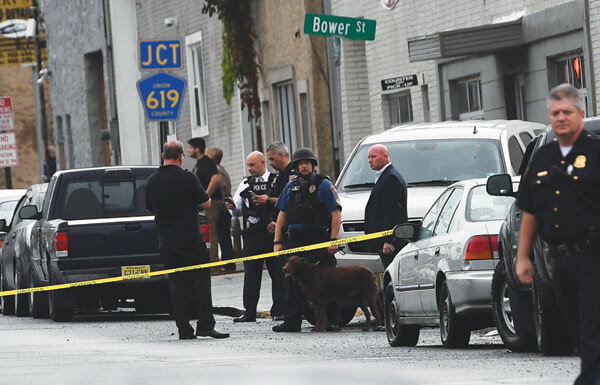 Josh Weiss, president of Congregation Anshe Chesed in Linden, the city in which suspect Ahmad Khan Rahami was captured on Monday after a shootout with the police, said that within the last eight months the Orthodox synagogue has participated in Community Security Service, a nonprofit organization founded in 2007 that partners Jewish organizations with the police and government authorities in training volunteers in professional security techniques. A police officer is stationed outside Anshe Chesed each Shabbat as well. That these events occurred so close to home should reinforce their claims that such measures are necessary, Weiss said. Even before the bombing in Chelsea — another explosive device was found and defused just four blocks away later that night — New Jersey was a part of the story. Early Saturday morning one of three pipe bombs hidden in a Seaside Heights trash can detonated near the route of the Semper Five Marine Corps Charity 5K race; a delayed start prevented any injuries. Though New York Mayor Bill de Blasio said that evening that he did not believe the two bombings were related, the FBI stated later that Rahami was, in fact, a suspect in both incidents. The next evening a backpack containing five explosives was found near the train station in Elizabeth, the city in which Rahami, a naturalized U.S. citizen from Afghanistan, lived. Later, Adina Abramov, JEC’s chief marketing officer and director of admissions and recruitment, said that the school had doubled its private security at both campuses and had instituted a “lock-out,” in which only students and adults with IDs are allowed into buildings; in addition, lunch would be provided to students since they were prohibited from leaving school for lunch. At the time she spoke to NJJN, Abramov said the protocols were still active, even though Rahami had been taken into custody by then. “Thank God they caught the guy, but we remain vigilant, and our security measures remain in place,” she said. Much has been made about de Blasio’s assertion on Saturday night that the Chelsea bombing was “an intentional act,” even as he maintained that there was no evidence of a “link to terrorism.” Republican presidential nominee Donald Trump said it was terrorism only minutes after hearing of the bombing; Democratic nominee Hillary Clinton was more measured in her response, but acknowledged that it was an “apparent” terrorist attack. Both New York Gov. Andrew Cuomo and NJ Gov. Chris Christie called it an “act of terrorism” the following morning, but the mayor waited until Monday to do the same.